The likes of the App Store and Google Play have truly morphed the mobile gaming landscape. Handheld consoles have largely been phased out as gaming fans instead score their fix through smartphones and tablets. Some of the video gaming world's pioneers, like Sony, have long embraced the new opportunities, while others—namely Nintendo—have only recently taken the bait. 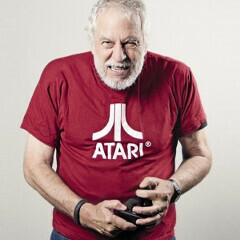 Atari is a name synonymous with what many would deem the Golden Era of gaming, and at 72 years of age, its charismatic co-founder Nolan Bushnell has seen (and overseen) plenty of change. In an interview with The Guardian, the so-called 'godfather of video games' has shared some of his observations on the present state of the industry. The benefits of network connectivity and social gaming is something that most of us take for granted. Bushnell always wanted to apply such functionality during the early days of Atari, but the tech, of course, just wasn't in place. The idea of competitive, connected gaming is a virtue that Bushnell still holds dear, and having joined forces with Dutch publisher Spil as an advisor, it will be interesting to see what kinds of projects spawn from the collaboration. The first of three Bushnell-influenced titles is slated to arrive early on next year. The full interview, which is an enjoyable read for any long-time gaming fan, can be viewed at the source. So true. I hate how 99% of mobile games are no fun if you don't do any ingame purchases. They just revolve around making you wait for hours if you don't pay for it. The small named games are games about fun, but those big names like clash of this and that are all about making huge profits from kids. All AAA games nowadays usually keep game data server sided. I doubt that will be good most of the time. True. I find very few games are touch screen friendly, compelling, and don't have in app purchases or game economics that drive you crazy. I'm ok with Angry Birds, and World of Goo. It's telling of the industry that the games you're okay with are nearly a decade old. Most game developers today are just doing freemium half-baked games to cash in more from gullible players. Actually is nowsday games is only important the graphics but forgot the gaming experience. Not only mobile but PC, Console games as well. They're comparable to those flash games because many originate from the same scammy browser games of decades past. Some of the z generation are already in college. So far i'm still seeing them enjoy mario, starfox, etc. Only game which has stayed on my phone since I got it is Super Stickman Golf 2.